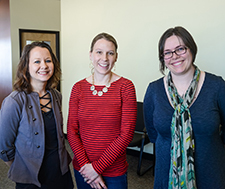 Sarah Thorson (left), Erica Chua (center), and Elise Niedermeier (right), all from the Minneapolis Park and Recreation Board. Niedermeier is a MNLEND Fellow. AUCD is a membership organization that supports and promotes a national network of university-based interdisciplinary programs; ICI is a member of this organization. The Minnesota Leadership Education in Neurodevelopmental and Related Disabilities (MNLEND) Program is an ICI center.